I'll be in the United Kingdom, on a short speaking tour. It's always a challenge to pack for a six day trip, especially if you are committed to only carry on bags. I am loathe to ever check baggage as it can slow me down, make me crazy and leave me w/o my gig clothes. My schedule is nuts: I get in Tuesday AM, recover all day, then have two gigs in Leeds on Weds. Thursday is two more gigs in Goelle and Friday is three gigs in Harrogate. Saturday I fly home. I'll have what I'm wearing (sans the jacket to suit #2) dry cleaned when I get to the UK. Believe it or not, I have everything I need with this configuration. As a speaker, you travel for a living. The next time you take a multi-day trip, consider a plan for carry on. With a little planning and a few key tools, you can do it too! Here's an excerpt from my Q/A after my keynote address at the Meeting Professionals International annual education conference in 2008. The topic? If not you, then who? Who will do the right thing that needs to be done? Give up your riches for a hero from Tim Sanders on Vimeo. I had a speaking engagement last week in Sao Paulo Brazil at the World Management Conference. I flew in via a red eye, had one day on the ground and flew a red eye to my next gig in Chicago. I didn't get sick, and no one in Chicago told me I looked like hell, which I should have after 10 straight days of travel. How did I keep myself healthy? I ate local fruit, drank a alot of water and got every second of sleep I could find. It was a recipe for road warrior health. Where's the fruit? Everywhere. I took the above picture at the elevator. 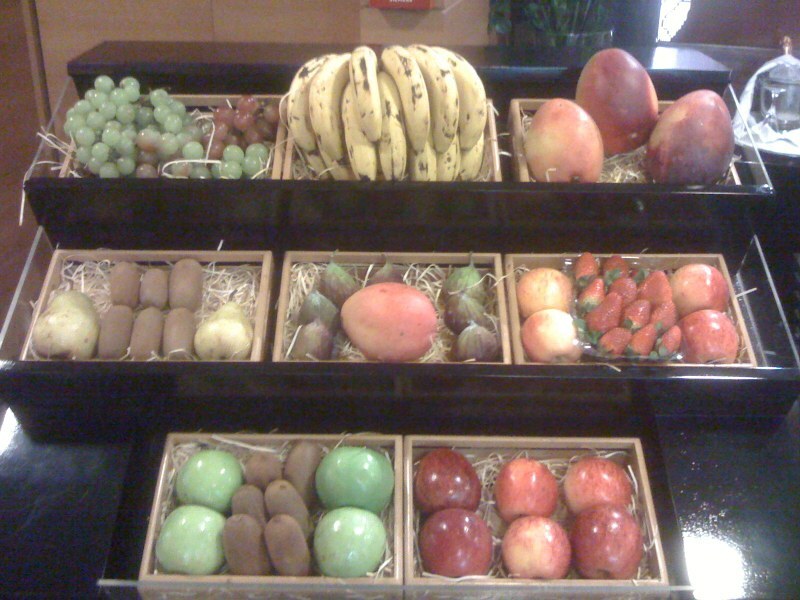 At this hotel (WTC Hotel), every floor offered an array of fresh fruit. I avoided any fast food or plane food and wrote down everything I ate (which improves my self-monitoring). Wherever you travel, look for fresh fruit: hotel lobbies, convenience stores, restaurants. It is the secret to dealing with jet lag. PS -- My second book (The Likeability Factor) came out in Brazil last week. It was exciting to see it in Sao Paulo book stores, in between Gladwell's Blink and The Secret! 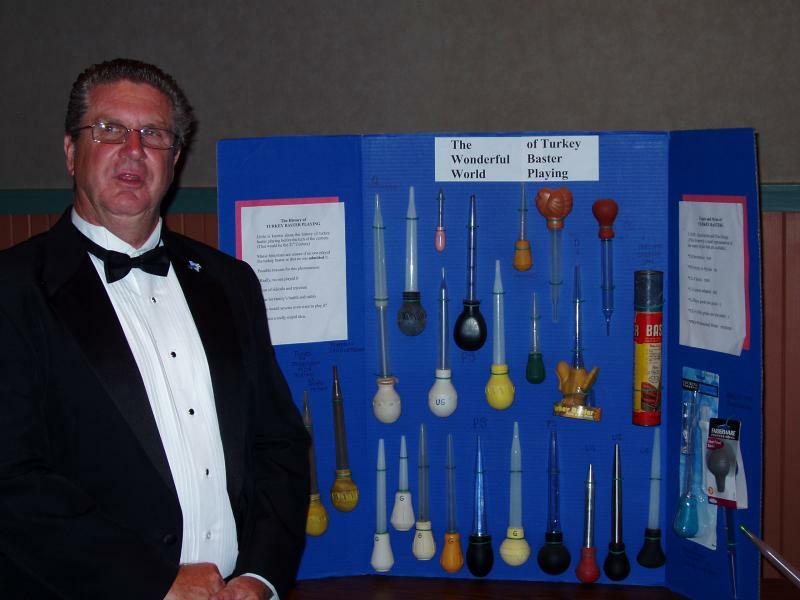 Last night, on a flight to LA from Houston, I met the 'other' Sanders -- Ray Sanders, the virtuoso turkey-baster player. That's right, he plays the turkey baster (like a flute). He was on his way to LA to be on the Jay Leno show (this Friday, May 23). We quickly found out through conversation that we had a lot in common: both from Texas, both love music and he knew a few of my in-laws. This guy is a hoot! You have to visit his website to appreciate his sense of humor, and how seriously he takes his turkey-baster playing. He loves to play The Flight Of The Bumblebee or the William Tell Overture. He was a sweet, interesting and entertaining conversation partner over the three hours we sat together. Actually, I needed to do some email catchup work and finish some light editing on my new book. In retrospect, I’m glad I spent the entire flight talking to Ray Sanders. His attitude and energy invigorated me, and I’ll have a friend for life. 1. The work we do on planes is of marginal quality, given the horrible environment of cramped corners and distractions – so invest plane time in something more rewarding – like conversation. Business travel is getting harder and harder each day, due to airline policy changes. But one thing never changes: There’s a lot of interesting people flying the friendly skies if you take the time to notice. For the first time in the Internet era, I took an overnight business trip and left my laptop at home. I've been thinking of going laptopless on a trip for a while because of the extra weight, security hassle, risk, etc. Also, my book is done, so I'm not furiously typing all the time. With all the talk recently in the media about laptopless meetings, I decided to go the extra trip and have a laptopless trip. On Monday, I flew from LA to Oakland for a talk early Tuesday AM. It's a short flight and a quick trip, so I hatched a simple plan: Bring my suitcase, glasses, a book, my Iphone and a USB stick filled with emergency files (my database, my powerpoints, etc.). How did it go? I read most of a book (Michael Port's new one on biz-life management), saved $13.00 on hotel internet access and kept up with important email via my Iphone. I sailed through security and even saved enough time to catch an earlier flight home from Oakland. Now that I've done this, I can carry my baby Martin guitar as my second carry on item. No more boredom on the road! Will this work for long haul or multi-day trips? Maybe not. After all, I need my files, letter writing capability, etc. However, I'm pretty stuck on the idea of my suitcase replacing my briefcase, so I might choose Guy Kawasaki's solution in the long run. 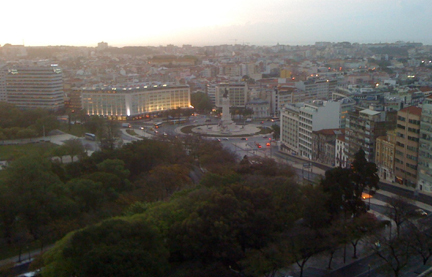 I'm in Lisbon today, giving a talk for Nokia. I shot this photo on my iPhone from my hotel room this AM. Here's a handy biz-travel tip: When you fly to Europe (usually overnight), don't take a nap when you land! Motor through the day, and go to bed when the locals do. This way, you will avoid not being able to fall asleep due to jet lag. The first few times I went to Europe, I'd land in the AM, fall asleep, wake up and go out to eat. That night, I'd toss and turn or wake up at 3AM and never get back to sleep. It made me a zombie. Now, I motor through. Last night, I actually got 7 hours of sleep (with no Ambien). Today I feel good, just like I was home. PS -- When you wake up on your second day in Europe, make sure and let in the sunlight as it teaches your body the new time zone. I travel well over half the year in my business. While it is important to have internet access, it is even more important to have battery power for all of my devices. I carry a cell phone, an IPOD, a laptop and even an Emwave Personal Stress Reducer. All of them run of out juice during the normal workaday on the road. 3. Invest in a singe device solution that can power everything. I love IGO's product. It's not much bigger than my laptop charger and comes with adapters to charge EVERYTHING that I own (you can do two devices at once). It also gives you power on a plane! Unless you like to carry a barrage of wired electronics and get screened like a terrorist, reduce the wires and go with IGO. Traveling with unlimited power will change your life. All it costs is a little money. The next time you need a ticket counter person to give you a break, give her a break up front. Think of her as the person who will get you on the flight, get you a better seat or get you back home in time for your daughter's recital. Don't think of her as the obstacle or the person at the airline responsible for your situtation. I was talking to a travel industry executive in Oklahoma City last week and he confirmed this theory. Friendly travelers get better service than belligerent ones. The airline employees on the ground do not care that you are a frequent traveler. That is a commodity these days. No one behind the counter cares how important you are, they care about being treated with respect. When I was writing The Likeability Factor, I discovered studies that suggested that a smiling and likeable patient gets more time with a busy doctor and is rescheduled quicker. One study on high school students in Southern California found that the number of times a girl smiled was more of a driver of her popularity than her physical attractiveness. A 2002 study on customer service found that if you are likeable and competent, you have a three fold increase in the likelihood of getting satisfactory service. Smiles are the key. Try this out the next time you need help on the road. Take a deep breath, think a positive thought and smile at your new travel partner at the counter. She's likely to reciprocate by going the extra mile(s) for you. Once you find it works during travel, try it out on your family and friends when you get home. For the last few years, I have bragged about JetBlue's inovative thinking to anyone who would listen to me. They segmented the flying experience, improved each link in the chain, and created the first real scale breakthrough in people flying since Southwest Airlines. And then the crash, not of a plane, but a system. Horror stories abound. For the last few weeks when I mention an innovative JetBlue employee or customer centric strategy, people just roll their eyes and say, "yeah, you heard what happened to them!". They had a failure to imagine, that is what happened to them. They faced a huge speed bump in their growth. The real issue is how they responded. 1. Hired new operating chief to fix this in the system. Moreover, they are heartbroken about this too. Check out this YouTube clip with their CEO afterwards. For the last few years they have hired for and promoted human relations between airline and customer. In a dozen or more long haul trips I have been very satisfied, entertained and saved thousands of dollars. It is like Southwest without the cattle call. I'm taking a stand here. JetBlue thinks differently about their people, their passengers and flying as an experience and not just a delivery service. I'm booked to fly on them later this week and I'm confident it will be fantastic. We have to give the leaders in innovation a second chance. If this happened to Delta (again) or United, we would just yawn. But it didn't, it happened to JetBlue of all airlines. Since they've been seperated as one of the two most profitable airlines, the long knives came out when they had their delay meltdown. I have it on good authority that competitors, posing as customers, piled on to make things worse. And we babbled, blogged and squawked about it. It's time to settle down and give them a mulligan.